Wait, I recognize that familiar voice: melodic, gritty and raspy, with strength and range. Salute is the new project from Last Autumn's Dream vocalist Mikael Erlandsson Sweden's best answer Bryan Adams. On board with him is fine guitarist and producer Martin Kronlund (DogFace, Gypsy Rose, White Wolf). 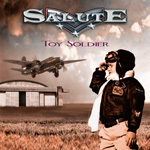 If you dig anything and everything from LAD, you will love Salute's debut Toy Soldier. For most fans of Erlandsson, LAD, and melodic hard rock in general this is all the information they'll need to buy the album. They would be right: Toy Soldier is well composed and performed solid melodic hard rock from two individuals who know how to do it. But how does Salute distinguish itself from all things LAD? Well, except for some songs, like Dynamite or Running Away with You, which are a bit heavier, it really doesn't. Call it the sword that Erlandsson and Kronlund will have to fall on: inevitable comparisons to Last Autumn's Dream. But that's hardly a bad thing. Why? As I said before, the music is exceptional melodic rock. There's not a filler here. Simply delightful melodic hard rock, plain and simple. Salute is essentially retrofitted Last Autumn's Dream with vocalist Mikael Erlandsson with Martin Kronlund (DogFace, Gypsy Rose, White Wolf) on guitar. If you dig quality infectious melodic hard rock performed by masters, Toy Soldiers is a class act.